Coming back from E3 in June, I decided I'd seen my excuse to go get a Wii. NBA Jam, which we'd given a best-of nomination, and which was absolutely thronged inside Electronic Arts' booth, open to close. "Why?" Plunkett chided me. "You know they're going to bring it to the PS3 and 360. It's inevitable." Sure enough, about three weeks after I bought the Wii, EA Sports confirmed that NBA Jam would be included as a free download with NBA Elite 11 on those two consoles. The version would lack one of the Wii game's modes; but it would have online multiplayer where the Wii didn't. Then came Monday's stunning announcement that NBA Elite 11 would be delayed indefinitely. Somewhat overshadowed, by what could be a $60 million hit to Electronic Arts' bottom line, is how this affects NBA Jam. Overshadowed in news reporting anyway. In comments and forums, NBA Jam's PS3 and 360 fans were quick to size up the situation and clap for joy. NBA Jam will be uncoupled from NBA Elite - one factor that has many thinking Elite will be canceled outright - and made available by the holidays, though it's not yet clear if it will be as a downloadable title or a retail disc. It's extremely doubtful NBA Jam would have been the kind of game that sold Wiis in any noticeable amount. My motivation was highly anecdotal. But EA Sports' decision to put its core console version in direct competition with its Wii release of NBA Jam is not without consequence. The same analyst predicting the $60 million drain from Elite's holiday absence says the 360 and PS3 NBA Jam could cannibalize as many as 100,000 copies from the game's Wii sales that quarter, though the revenue will be more than made up by sales on the other platforms. For - and this is my speculation only - it's not a sure thing that the 360 and PS3 version won't be getting the "Remix Tour" mode, which is supposed to be exclusive to the Wii's Jam, if the 360/PS3 version ends up being a disc release. Which it may have to be if Electronic Arts seeks to blunt the damage of not having an NBA title on two of the three consoles going into the holiday season. A digital-only release would seem to significantly cut its potential as a gift purchase. Further, 360 and PS3 owners know this game was supposed to be a free rider on NBA Elite. Full titles on PlayStation Network and Xbox Live Marketplace top out at $30. Having taken a huge blow in customer confidence, over NBA Elite, EA would do very little to recoup it if it tried to sell the free Xbox 360/PS3 download as-is, on a disc, for $40 or $50. Argumentatively, that would mean Elite is worth $10 or $20 if the thing comes out later, especially if it has the free copy of Jam as originally intended. If Elite does make it out by the holidays, then it's there competing against one of its former primary selling points - Jam, whose burning-basketball logo and "boom-shakalaka" catch phrase appended many trailers and marketing materials for the main game. The problems caused by these entanglements and the damned-if-you-do nature of all the options show that delaying a sports game over quality concerns is not like delaying BioShock 2 or Red Dead Redemption for the same reason. Short of cancellation, it's about the worst thing that could happen. And if it truly does cause $60 million worth of damage, it tells you that EA Sports expected to lose more than $60 million in the long run if NBA Elite 11 was released in this state. It may have feared the end of the franchise. In its damage control campaign, EA Sports may have also closed the door to the Wii ever being anything more than an adjunct to the sports gaming experience, despite what is often said about supporting the platform and its gamers. Wii owners who love the genre had NBA Jam as a trump card for all of five months. Now they have good reason to wonder why titles truly unique to their console, and valuable for that reason, are so rare. NHL 2K11 is best played with the classic controller, not the Wii remote. NHL Slapshot, with its hockey stick peripheral, has seen some favorable reviews and enjoyed decent appeal, but nothing world-beating. Not like Tiger Woods PGA Tour, with a Wii remote, was up until now. A completely different experience on the Wii, it's the only multiplatform sports title scoring better on that console in the past two years. Yet the PlayStation Move will bring the same type of game to the PS3 with better visuals. 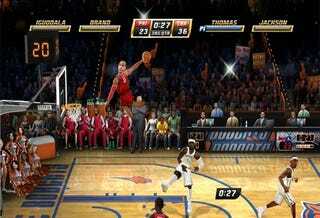 Now this happens with NBA Jam. Despite the fact the game was announced (and, ostensibly, developed) for the Wii first, its lack of online multiplayer makes it appear to be the "gimped" version, just as much as the 360/PS3 version does for lack of the Remix Tour. Perhaps even more, when you consider the nature of the game and what will drive its replay value.